When the clock is seeking for the WWVB radio signal. I been working on the software that will run my weather clock. The one nice thing about Arduino is that there are a lot of examples of how to do things but those examples are limit to what the original developer wanted to do. For example the LED display code I found works great but only supports single color bitmaps. I wanted to have the ability to color all 3 colors of the display from the display. So I reworked the code to do that. When I get closer to being done I'm going to upload the code and share it. I think the examples should be shared also they can be improved on. If a class is developed it should be place in a shared location instead of a forum. While the clock is something I want to make personal. I would like to see others help make it more. The code could later be used for other projects. 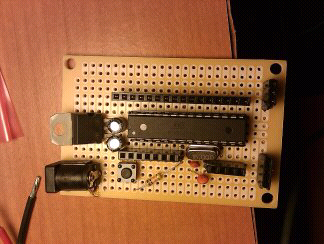 My first home made Arduino! I'm going to use my original Arduino for developing code and checking that the code works. This will be used as a base to start combining hardware and software I'm working on. Next time I'm going to etch my own circuit board. I think it would save me time and look nicer. If you are looking for cheap power adapters go to Radio Shack.com. They have 6v/1800ma supplies that work perfectly. How cheap.... a $1.47! WOW! That is a nice price. I couldn't buy it at the store, in fact, the manager looked at me like I was crazy since the cheapest one at the store was $18. Found this looking around at AVR Projects. Its a really good Atmel cheat sheet when you are getting started. Print it out and keep it close. It will save you a lot of time when you are unsure which pins are doing what.